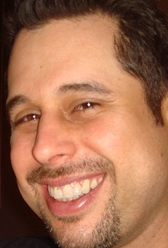 In this exclusive interview with Victor Solano, Senior Manager for Learning Experience and Frameworks at Autodesk, we explore how the software giant has leveraged the power of the crowd, software standards, and content management to meet the fast-changing needs of its customers. There are many lessons to be learned here, including the fact that the ways technical communication professionals have created user assistance content in the past may not be the way we do so in the future. An opportunity for change? Certainly. A tactic that provides huge efficiency gains? Indeed. Food for thought for your support efforts? You betcha! TCW: Victor, thanks for making time to speak with me today. After our recent webinar (recording available/registration required), I’ve received lots of queries about the topics we discussed. To familiarize our readers who haven’t heard the webinar, start off by telling us a little about Autodesk WikiHelp? VS: The Autodesk WikiHelp provides the global audience of Autodesk product users with a new type of socially-enabled help system that combines the best content authored by Autodesk staff with articles, videos, tips, comments, tags, and other content contributed by the vibrant and talented Autodesk user community. Currently, 26 Autodesk products and Suites publish their help content to the site in 14 languages. Many of the products use it as the default help system and have a context-sensitive help integration directly from inside the applications to the relevant content in the WikiHelp. 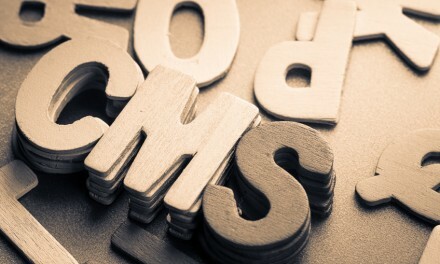 All user content goes through a content moderation process to insure quality. Autodesk WikiHelp content is continuously changing based on feedback, direct user edits, and a rapidly developing two-way conversation with our users. The experience combines help topics with learning videos, tutorials, and even a search tool that searches other Autodesk sites with learning content, such as our Discussion Forums, the Support Knowledge Base, Community Sites, and even YouTube. The system has direct connectors to the Autodesk Help Content Management System so we can publish content as an output directly from DITA/XML to the learning portal and we can also batch-load videos. The video on the Home page of the WikiHelp explains the whole concept in 2 minutes. Make sure to expand it to full screen when viewing. TCW: Why did Autodesk create WikiHelp? Why was it needed, exactly? VS: Autodesk is an innovative company and this project is one of many experiments to try new approaches to improve customer learning. Since Autodesk products continuously evolve to provide a competitive edge to our users, it is important that our learning solutions adapt, keep up with the times, and recognize how our users prefer to learn. Given our users’ preferences for visual learning, combining text and rich media, and a combination of hands-on learning options with non-linear just-in-time learning in a socially-enabled world, this project is an important step to better understanding how we can better serve those needs. Autodesk WikiHelp seeks to enable an already existing community with new interactive tools that accelerate their learning process, rather than create a new community. We realized that many of our users were already consuming and contributing learning content in a vast and varied learning ecosystem with many competing options. Over 10 million Autodesk users are actively seeking and exchanging knowledge on Discussion Forums, Community Web Sites, AUGI (Autodesk User Groups International), blogs, Facebook, Twitter, industry websites, YouTube, an a rapidly evolving multitude of CAD and social media sites. They are connecting and providing each other with information, resources, and support. Some users expressed sometimes being overwhelmed with so many options. Using the Autodesk WikiHelp, users can have access to the best help content provided by Autodesk, user contributed content, and leads on other resources in the community, with the ability to rate and comment, all in one place. It is a fresh new experience. TCW: Why didn’t you just improve your existing Autodesk help products and documentation? Isn’t that the real problem? VS: Autodesk has been winning Society for Technical Communication awards for help and documentation for many years. Improving our content remains our top priority. Still, user expectations change rapidly, and with the advent of YouTube, Google, fast access to knowledge, the social media phenomenon, and participation in a dynamic and connected world where users simply expect that their voices will be heard, the bar has been raised for everyone. Autodesk WikiHelp has helped to us to offer new types of content, by combining text with rich media, integrating user-generated content, and has helped Autodesk products to provide a more continuous and responsive learning experience. Autodesk WikiHelp provides integrated HD-quality learning videos as well as topics, articles, tips and tutorials. Some of the top content may actually be contributed by our expert users, who never stop impressing us. 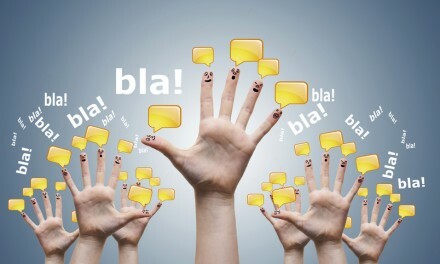 Users can then rate and comment on the content. In addition, there is a large need for specific niche knowledge that is best served by enabling peer-2-peer interactions and collaborating directly with our users, rather than exercising traditional methods. This helps us recognize and serve the Long Tail of Knowledge, a vast and shallow pool of specific user needs that tends to be underserved with traditional approaches and one size fits all solutions. Users tend to congregate and find each other as they have more specific needs to directly apply our applications. By providing integrated social learning tools with our Help, our users can help each other and we can collaborate with them to better understand and serve these needs. TCW: Why do you think a socially-enabled help community like Autodesk WikiHelp is worth the effort? What are the benefits? How do you know your members find it as valuable as you say it is? VS: We listen to our users and the response of the community has been phenomenal. 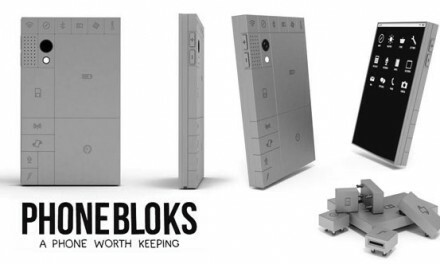 Usage and engagement has exceeded the expectations of the products that are participating in the project. We continuously receive feedback on the Help pages through comments, emails through the Feedback link, user research, and we also keep a sharp eye on the site analytics. The main benefit is improving the learning experience for our users. We do this by providing a more dynamic and continuous learning experience that leverages rich media and provides new tools that allow Autodesk and the rest of the community to collaborate, making the whole experience more responsive and effective. Some other key benefits are access to detailed analytics and intelligence on content usage (see popular pages), information on user focus and priorities, specific information on user learning preferences, as well as direct and specific user feedback on our content. This allows Autodesk to make better decisions to serve the user learning needs. We have also seen an evolution of the roles of our writers and subject matter experts as they become increasingly engaged in direct interactions with our users. TCW: Aren’t there problems with allowing users to create content on the Autodesk WikiHelp site? After all, they don’t know your style guide rules and most likely don’t have experience as professional technical writers. Doesn’t this approach just create a big mess of content of questionable value? VS: Quality is supremely important, which is why we have a moderated system with some checks and balances. 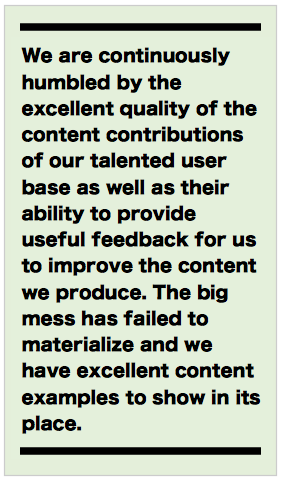 It can be challenging for an organization to allow highly edited professional content to exist side by side with user generated content and this can give way to fears that the users may “ruin the existing content” or “contribute content of questionable value.” In practice, we have found the opposite to be the case. We are continuously humbled by the excellent quality of the content contributions of our talented user base as well as their ability to provide useful feedback for us to improve the content we produce. The big mess has failed to materialize and we have excellent content examples to show in its place. 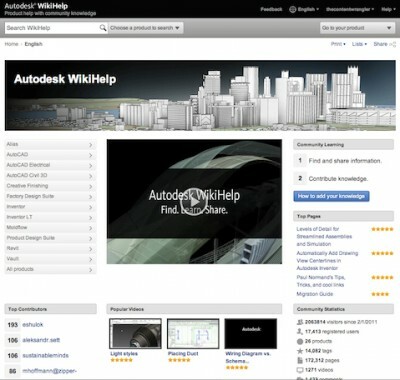 TCW: What do you do to encourage participation in the Autodesk WikiHelp community? Do you provide incentives? Digital candy? Badges? VS: On the home page of WikiHelp, you can see a leader board with the top contributors. The system tracks contributions (edits, new pages, videos, and so on) and we can run reports to understand who our top contributors are for different products. Some products run contests and users register to win prices. In addition, our community leaders, bloggers, and social media folks invite and promote participation to insure visibility of the project and encourage engagement. TCW: What types of roles did you create to help ensure the community doesn’t become a vast wasteland of user-generated content? And, if you created new roles, did you create internal roles (like community manager) as well as external roles (like super user)? VS: Rather than create a multitude of new roles, what we actually did was to evolve current roles and processes and connect the users assistance organization to others across Autodesk. Some of more technical folks in the user assistance organization that are in charge of build and integration, quality checks, and production of our “help systems” to HTML Help or other formats, now also create WikiHelp outputs from our content management system (CMS). Some of them serve as Wiki Administrators and help manage user permissions, create new product spaces, and help insure the system is running smoothly. Now, in addition to authoring content, our authors and subject matter experts help moderate user content and respond to user inquiries through comments and the feedback link. Also, content authors may move some content from the WikiHelp back to the CMS system and edit it so that it can be integrated into the official stream, quality-checked, and localized according to our style and quality standards. 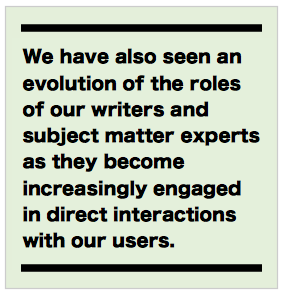 To some degree, some of those roles have evolved to curate as well as author content. Our user assistance teams now collaborate more closely with the community teams in marketing, the web, and support. They have undergone training to understand new social media standards for interacting with the community directly and have become more connected with our social media teams. Some leads have taken training in analytics. They run reports to measure usage, engagement, and contribution and bring back this data to their teams to inform future decisions, measure progress, and help set new goals. In regards to the “super user” question, we do also have some pilot programs with community moderators in our international communities that would fit this notion. 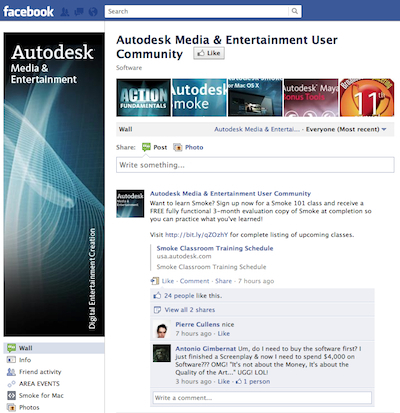 We have worked with our Autodesk Community managers to reach out to some highly engaged users and community leaders. We have “deputized” some of these community leaders and top contributors with special super-permissions to moderate community content before it gets published and collaborate with our internal staff. They are also leading programs to help build user engagement in their communities and contribute top content. TCW: What is the biggest value Autodesk has realized by moving to a Help 2.0, socially-enabled support community? VS: Our focus is on creating value for our end users. By providing a combination of Autodesk authored content with access to knowledge from our expert community and enabling a multi-directional conversation to evolve, the learning experience has become more responsive and effective for our users. There is great value in responsiveness, providing continuous learning, access to new types of content, enabling rich media, and flexibility. We are also learning what works best and we have better tools to inform us of how to invest our energies in the future. TCW: What changes — improvements, new features, innovations — do you expect to introduce into Autodesk WikiHelp in the future? What do you see in your crystal ball? VS: We are continuously listening to user feedback on how to improve our learning options. We are gathering data from our users to inform our priorities for future development. We will keep you posted. TCW: Some technical communicators and e-learning professionals have said that this new approach at involving the customer (especially in socially-enabled ways that allow user-generated or co-created content) is just a fad that will soon disappear after companies like yours realize that it was a bad idea with little value. What do you have to say to the naysayers? VS: I would say “nothing ventured, nothing gained.” It was time to take the conversation from an academic “what if” discussion to testing the waters and measuring tangible results. The early results are impressive and we will be continuously measuring value and progress. It may be that the data and results from this project help lead us to identify even better ways to serve our users’ needs. At this time, the Autodesk WikiHelp project is part of an effort to provide a competitive edge for our users and the associated feedback and hard data is very encouraging. We intend to always find the best ways to serve our user needs and that means taking action and sometimes defying conventional models to pioneer new ones. TCW: Wow, it looks like we’ve run out of time. Thanks for sharing your time and valuable lessons learned from the Autodesk WikiHelp project. I can’t wait to see how you are doing this time, next year. VS: Thanks, Scott. It was my pleasure. 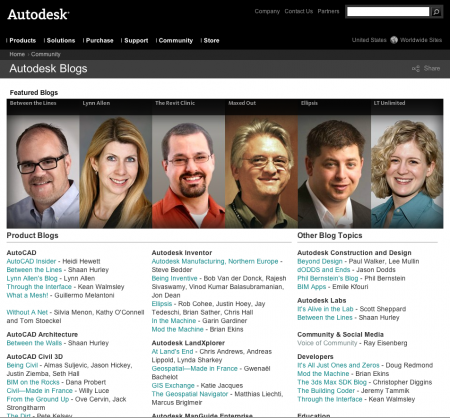 Autodesk is a leader in 3D design, engineering and entertainment software. Organizations in manufacturing, architecture, building, construction, media and entertainment industries—including the last 16 Academy Award winners for Best Visual Effects—use Autodesk software to design, visualize, and simulate their ideas before they’re ever built or created. PreviousShould You Ever Have To Make Up Your Mind?